The Associated Press reports that military officials have released the names of six Marines killed when their helicopter crashed Thursday in Afghanistan. The crash in the southern province of Helmand was the deadliest in Afghanistan since August, when 30 American troops died after a Chinook helicopter was apparently shot down in Wardak province in the center of the country. All six were based at Marine Corps Base Hawaii in Kaneohe Bay, Hawaii, said base spokeswoman 1st Lt. Diann Olson. Capt. Daniel Bartle, 27, of Ferndale, Wash.
Capt. Nathan McHone, 29, of Crystal Lake, Ill.
Cpl. Jesse Stites, 23, of North Beach, Md. Cpl. Kevin Reinhard, 25, of Colonia, N.J.
Bartle and McHone were the pilots of the aircraft, while Riddick was the helicopter’s crew chief. Their squadron had been sent in August to Afghanistan as part of a seven-month deployment, Olson said. 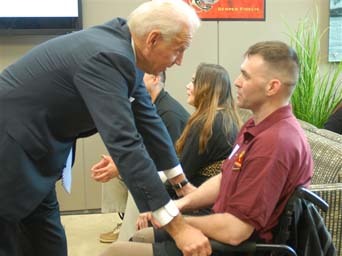 Biden with a wounded warrior. Photo courtesy of the American Forces Press Service. “We have a lot of obligations — to the old, to the young, to educate — but we have only one sacred obligation, and that is to equip those we send to war and care for those we bring home from war,” Vice President Joe Biden told the troops at the Wounded Warrior Battalion West, Camp Pendleton, California according to a report by the American Forces Press Service. “It is the single most significant obligation the United States of America has,” he added. Biden and his wife, Dr. Jill Biden, visited the Warrior Hope and Care Center Friday. The vice president said he’s been in and out of Afghanistan and Iraq 23 times, but “not like you,” he said, addressing a wounded Marine in front of him.